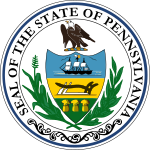 The 1832-1833 United States Senate election in Pennsylvania was held on eleven separate dates from December 1832 to December 1833. On December 7, 1833, Samuel McKean was elected by the Pennsylvania General Assembly to the United States Senate. ^ a b "U.S. Senate Election - 1832-33" (PDF). Wilkes University. Retrieved 22 December 2012. ^ a b c "U.S. Senate Election - 7 December 1833" (PDF). Wilkes University. Retrieved 22 December 2012. ^ "PA US Senate". OurCampaigns. Retrieved 22 December 2012.